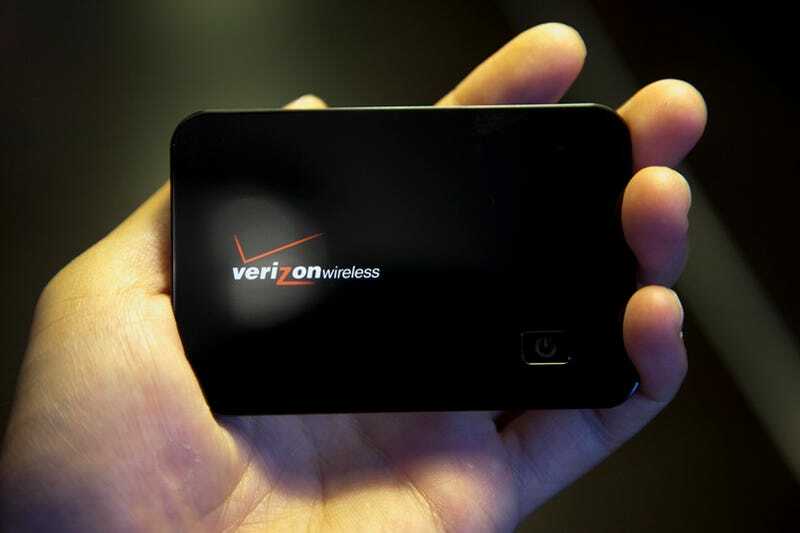 The MiFi is gorgeous, and about as big as a business card holder. And miraculously capable of connecting to Verizon's 3G cellular network and spitting out Wi-Fi to up to 5 clients. The device is manufactured by Novatel, and instead of a metal top of the reference design, it has a plastic top, which I imagine is better for wireless signal reception. The 3G connection is a Verizon EVDO revision A connection, and it was not too slow while being tested from downtown Manhattan. The Wi-Fi itself is of the B/G variety, with basic security settings and the ability to hide SSID broadcasting. There's a web based UI for managing the hotspot, too. There are some variables as to how you connect the device to your computers and wi-fi devices, though. The micro USB port used for charging the device doubles as a connectivity port. When you connect the device to your computer by USB, the internet access can be turned on by Verizon's software. This charges the device, but disables Wi-Fi so no other devices can use it. Connecting the MiFi to the wall charger via the same port allows the Wi-Fi to be accessed. I do think that its nice that it is both battery powered and capable of being used as a tethered device. If you're going to use your 3G connection on only one device you're better off connecting it as such because transferring a connection over a USB port takes less power than over a wireless signal, even if its only Wi-Fi. Since it's an all in one machine, will it replace your house's internet? No, its not designed to, because of the limited range, and speed compared to cable modems and faster DSL connections. And Verizon's 5GB/month limit for its $60 unlimited plan. (There's a useless 250MB plan for $40). The MiFi is $100 with a 2 year contract, after a $50 rebate. Later in the year, Sprint will also carry the device, if you prefer their network better as we do. I don't know if I need this, as I've got an EVDO card for my computer, and my phone has internet on it. I guess I belong to part of the population that doesn't worry so much about portable WiFi on a separate piece of gear, no matter how nice the hardware is. But I'd take this thing. Smallest 3G/Wi-Fi combo I've ever seen. Fairly priced; about the same cost as a regular 3G data card, with more flexibility. Specifically for people who want to share a 3G connection with other devices; if you don't need that, get a regular card for your laptop. We rate Sprint's network slightly faster, and that device is coming out later in the year. Although the Sprint's metallic case may (I am only guessing) have worse reception than the plastic case.